It’s renovation chaos here: half of the contents of our house is in storage and we’re camped out in one room. So this week’s BotW is going to be short and sweet I’m afraid. 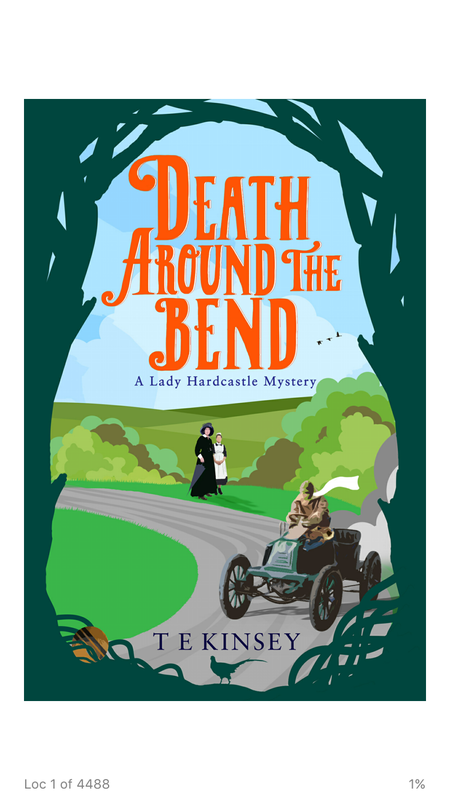 Death around the Bend is the third in the Lady Hardcastle cozy crime murder mystery series by T E Kinsey. I read the first one a few weeks back and picked up the third on a Kindle deal, and read it on the commute last week. The set up for the series is that Lady Emily Hardcastle is a widow with a somewhat more exciting past than is usual in the Edwardian era. She and her trusty maid Florence have moved to the English countryside for a bit of peace and quiet and relaxation but don’t seem to be getting much of it. In book three, Emily and Florence have been invited to a friend’s estate for a weekend of racing – but it’s car racing, not horses. Lord Ribblethorpe has gone mad for motor cars and has set up his own racing team, complete with a track in the grounds of his estate. When a driver is killed during a race, the police think it’s an accident but Emily and Florence aren’t convinced and can’t help but try and solve the crime. With Emily asking questions above stairs, Florence is sleuthing below stairs. Then another body is found. This is fun and fast moving (and not just because of the cars). I like the dynamic between Emily and Florence – and particularly that the story is told by Florence. I picked up the first one as part of my ongoing quest to find other series that scratch my Phryne Fisher and Daisy Dalrymple itch and it does this quite nicely – although it’s set earlier than either of those two series. Unfortunately there are only three books in the series (at the moment at least) so I only have one left to read, but hey ho, you can’t win them all. All three Lady Hardcastle mysteries are on Kindle Unlimited if you’re a member (I’m not) but the two I’ve read have come around on discount deals at various points too (that’s how I got them!). You can find them all here.